Like Merchant Ships wouldn't be living up to its proverbial name if I didn't start exploring my city's diverse marketplace. Nashville has two ethnic superstores called K & S World Market (one on Nolensville Rd., the latest on Charlotte Pike). We ventured in the latter this morning. It's brighter and less fishy than the Nolensville Road location. It had an astounding amount of produce, but the basics were still priced about like Aldi's. Even the specialty veggies were not as cheap as the Asian produce stand that used to be at the Farmer's Market. 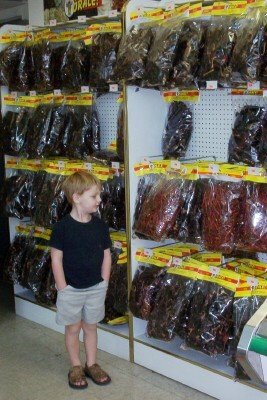 Still, they had a great variety of fresh herbs and an even wider selection of dried Mexican spices and herbs. Many of those were a better buy than either Big Lots or Wild Oats spices by the pound, particularly whole spices like nutmeg, allspice, and cloves. I found the large flaked coconut (unsweetened) I needed for a recipe--I've been looking for that since I went to the Mennonite market last year. Rice took up its own aisle, though there was basically one brand for each ethnic group. Condiments alone--Mexican, Korean, Japanese, Chinese, and Indian--took up at least two aisles. Any one of those was a savings over the price at a regular grocery store. The main drawback to this type of store is that there wasn't anyone to ask for help. I think we'll try visiting some of the smaller ethnic groceries sprinkled around town before we return to World Market. So far I've located Vietnamese, Indian, and Middle Eastern shops. I'll keep you posted! 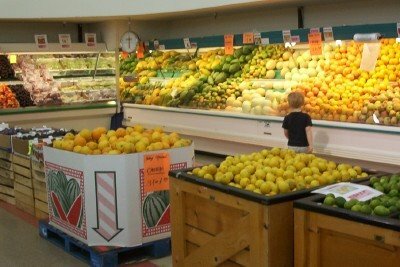 If you shop at ethnic groceries, what are your best buys there? I'd love your advice! Also the asian cookies are yummy and not over sugared. At Uwajimaya, I buy a seaweed seasoning (I'll get the name when I get home) that I put on rice -- it turns rice into a meal! I shop a Chinese store for fresh pineapple, snow peas, coconut milk, and chinese noodles. I usually always come home with something to experiment with in the kitchen! I would love to have the diversity that you have in Nashville! Enjoy! My best advice? Go with someone who knows what they are doing. It is possible to save alot of money! I just read your story on the K&S Market. Do they have any British foods? If not, do you know of any stores in Nashville that carry any British items?